118 elements are known and named at this time. Here is a list of elements of the periodic table, their atomic numbers, and element symbols. The list is ordered by increasing atomic number, which is the number of protons in an atom of that element. Each element has a symbol, which is a one- or two-letter abbreviation of its name. Sometimes the symbol represents an old name (e.g., Ag for argentum, Pb for plumbum, Au for aurum). This list is available for download as a CSV text file and as a PDF file. The PDF file is optimized for printing. 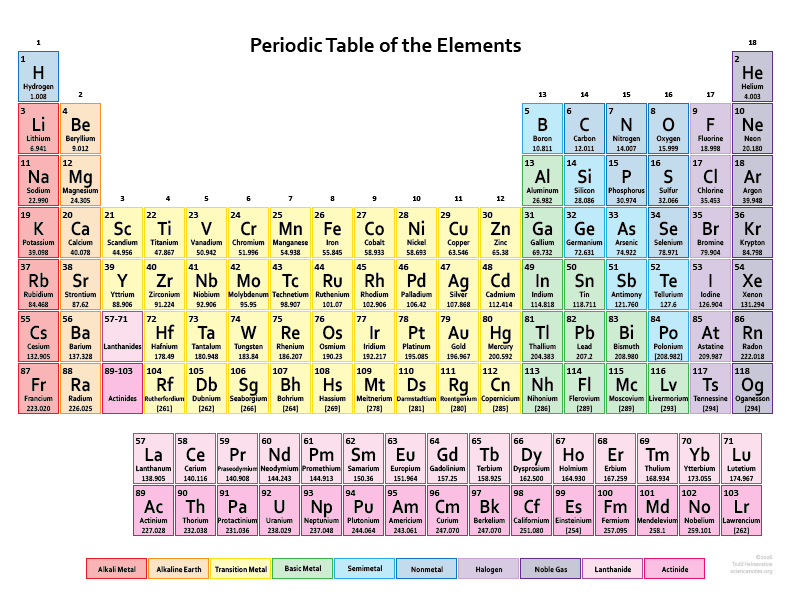 Right now, there are no blank spaces in the periodic table up to element 118. The present table has 7 periods. However, scientists are trying to synthesize even heavier elements. Once a new element is synthesized, the research has to be reviewed by the IUPAC before a new name and symbol get approved. The discoverer gets to suggest a new name and symbol, but the IUPAC has the final word. Until a new name is approved, the systematic element name is used. This name describes the atomic number of the element, followed by the -ium suffix. For example, element 120 has the temporary name of unbinilium. The temporary names are cumbersome, so it’s perfectly acceptable to refer to an unverified element by its atomic number (e.g., element 122, element 145).